YarnWars Presents New FREE Pattern! Today I’d like to announce my newest free pattern, available right here on YarnWars.com or available for pdf download on our group page at YarnWars on Facebook. The Twinkle Starlight Granny Square Free Crochet Pattern! Click on image for FREE written pattern. Why is it called Twinkle Starlight Granny Square? I made the square, just playing around with different ideas, and I created, what I called, a treble cluster. Now, to be very clear, I don’t know if there is another name for the cluster stitch I made in here, I literally just worked it as I went and I liked the result, so I named it and it became a part of the pattern, as a matter of fact, I’ve been trying to think of a prettier name for this stitch and so if you see it again in another one of my patterns, which is likely, with another name, you will know why! After stitching, looping, pulling, frogging, I finished with something I fell in love with. When I look at this square, I see a twinkling star in the night sky, now other people might not see this the way I do, but it was my visual & now for anyone who is interested, it is yours, today, FREE! On to my list it shall go, to create something bigger and better, because, to be honest, I will not be complete with this creation until I have actually pieced it into a larger something; a blanket, a bag, a scarf, whatever it will be, I will post my update as soon as I finish. If you decide to make this granny square, and let me also remind you that it only took me 15 minutes to make one of these with the ending, optional double crochet border, I would absolutely LOVE to see your final project, whether that ends up being just a square, or a bigger project, and you are always more than welcome to share your creations with the YarnWars group on Facebook. Not only will you become a part of an awesomely amazing group of most talented individuals, but you will have access to so many fun free patterns, both crochet and knit AND you will be alerted to all of the new challenges, contests & other fun events that we like to put on at YarnWars! 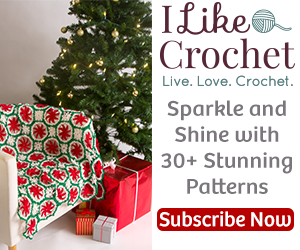 If you haven’t already, please take a moment to subscribe here at YarnWars.com, you will be alerted to any new Free patterns, we have a Power Hour segment at YarnWars which are full video tutorials of crochet projects, by anyone, that can be worked in under an hour. You will find these and so much more, including a full video Olaf tutorial & other basics of crochet at our YarnWars YouTube Channel! Thanks so much for coming by & have a wonderful day!